How can Chests be Incorporated in the Bedroom? 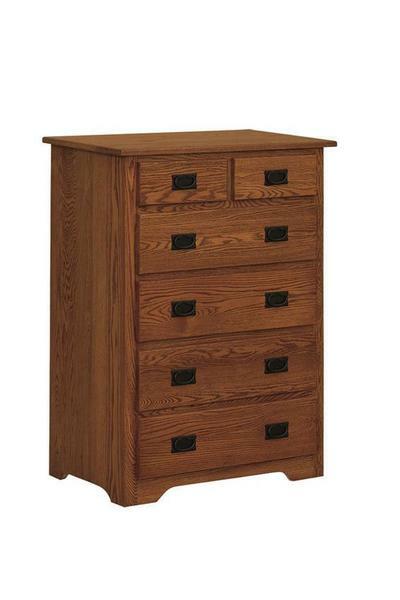 This tall, spacious Amish Mission Classic Chest of Drawers is perfect for any traditional home. With timeless Mission-style, this drawer set will not only last for generations to come, it will never go out of style! Place this handcrafted chest of drawers by your nightstand or dresser for handy and spacious storage. Ornamented with standard, simple black drawer pulls, this chest of drawers is the staple that your home's been craving. Support American Amish woodworkers and fair trade when you invest in our Amish Mission Classic Chest of Drawers. 100% made in America by expert Amish woodworkers, this solid wood chest is too good to pass up on. Decorate this chest of drawer's generous surface space with framed pictures that will make you smile and get you ready for your day! Organize you various knick knacks with small, decorative bowls atop this classic drawer set! Complete your bedroom set when you pair this chest of drawers with our Amish Mission Nightstand with four drawers and tons of class! Call us toll free at 1-866-272-6773 with questions or to order your new chest of drawers over the phone! Be sure to stop by our Amish furniture store in Sarasota, Florida to view some of our furniture in person.